After previously unveiling their new compact VR backpack PC, Hewlett-Packard has now announced the new Windows 10 homes 64 computer will be available to purchase priced at $3,000. 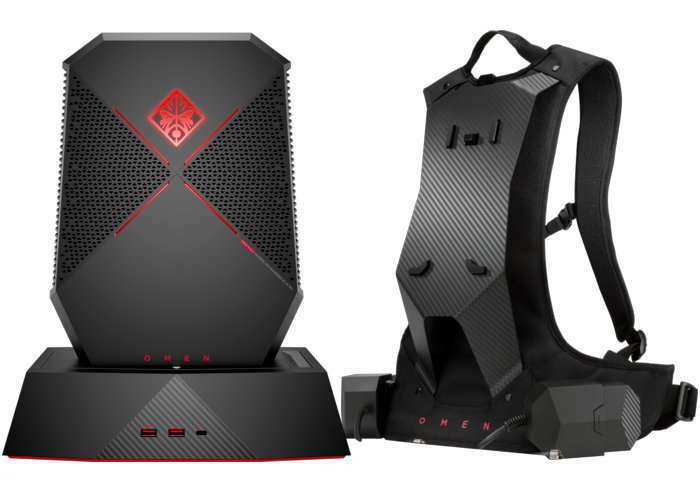 As you can imagine the system takes the form of two components both the OMEN X Compact Desktop PC system which is now available priced at $2,500 and the backpack priced at $500 which will ship a little later. The OMEN X is powered by an Intel Core i7-7820HK 2.9 GHz base frequency, up to 3.9 GHz with Intel Turbo Boost Technology, 8 MB cache, 4 cores, supported by NVIDIA GeForce GTX 1080 offering 8 GB GDDR5X dedicated memory. Other features include 16 GB DDR4-2400 SDRAM of RAM and storage offered by a 1 TB PCIe NVMe M.2 SSD. Liberate your game – Play at your desk, on the couch, or fully immerse with the optional VR backpack – it’s up to you. With the unique docking station and integrated rechargeable battery, you’re no longer tied down. Unleash the beast – Take over the game, even in the heat of battle. Includes a Quad-Core Intel Core i7 processor (HK series), unlocked for overclocking, and NVIDIA GeForce GTX 1080 graphics. And with an advanced thermal solution, your critical components stay cool. Virtual reality. Real freedom. – Possess the power to run even the most demanding VR games and experience fully immersive, tether-free VR gaming with the optional VR backpack. And with the DTS Headphone:X jack delivering true-to-life surround sound, you’ll feel like you’re right on the frontline.